An attempt to list the products I use, organized by task. Storing detailing tools and products. In total, my exterior detailing routine is spread out across two to three days. Obviously I don't do a full detail very often; two or three times a year is typical. Between the full detailings, I do wash the car fairly frequently, and use spritz to help maintain the paint protection and keep the surface slippery. I don't consider these things time-savers; the time spent on each wipe down is much shorter than a full detail, but I need to do it a lot more frequently. So in a year, I'll have spent as much or more time keeping the car clean. And I'll spend more on microfiber towels to avoid constant laundering. But my car will be clean a lot more often and I'll have less long-term damage to the paint. It's worth noting that my car is not a concourse queen. It gets driven. Life is short, I'm going to drive any car I can! Wash and rinse the whole car. I use wash mitt and a boar's hair brush when washing the body (the boar's hair brush is good for the gills, the kidneys and other nooks and crannies). I use the RaggTopp horse hair brush on the ragtop fabric. I use a separate wash mitt and Mother's brushes for the wheels, rocker panel covers and undercarriage (which I wash first). I rinse with clean water, and dry with microfiber towels. Once I washed, I dry as soon as possible to reduce the chances of water spots. Ideally, the rinse won't leave spots even if left to air dry, but most of us don't have ideal rinse water or air. In a perfect world, once I dry from washing and rinsing, water won't be used on the car again until the next time I need to detail. Clay where needed. This is usually the front bumper cover, the headlights, the mirrors, some of the front of the hood, the rocker panel covers and the rear bumper cover. Sometimes it's the whole car, it depends on how the paint feels to my hands (smooth and slick or not). I also clay the wheels, using a separate clay bar to avoid contaminating my body clay with brake dust. Polish the windshield with glass polish and glass polishing pads using the 3" random orbital. I do the glass first because the glass polish is the harshest of the polishes I use. I want ample opportunity to get it all off of the car before I polish anything else. Remove the glass polish from the windshield using microfiber towels and the fluid of your choice. I like Griot's Pre-Wax Cleaner. Polish the wheels if needed, and remove the polish. Polish the body. I usually do the hood first, then the doors, then the fenders, trunk lid and bumper covers. Clean or change pads as needed, and change polishes as needed (from coarse to fine). I like to remove polish from a panel before moving to the next panel; some polishes are unfriendly to remove if allowed to dry, especially on trim and weatherstripping. Wipe off the whole car with pre-wax cleaner. Tape off the weatehrstripping between the window and door, the ragtop and the body, and the A-pillars and glass. Apply the wax or sealant, with as many coats as desired. I normally apply a thin coat of sealant and allow it to cure overnight before applying another coat of sealant. I prefer polymer sealants over carnauba because it isn't softened as easily by heat. 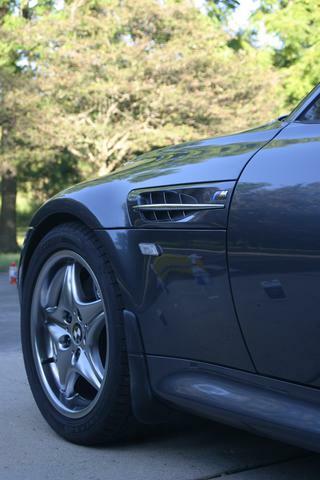 With the catalytic converters in the engine compartment, the hood of the M gets quite warm when parked in the summer. After buffing the final coat of sealant, I like to go over the car with a spritz or detailer. This helps buff any bits of wax or sealant I may have missed. When I'm using Wolfgang Deep Gloss Paint Sealant, I use their Deep Gloss Spritz Sealant spray since it is compatible and adds a bit more protection. Apply 303 Fabric Guard or RaggTopp protectant to ragtop. I've come to prefer 303; it's more readily available, I've noticed no difference in performance or longevity, and I prefer the spray bottle to an aerosol for application. Put the car up on jackstands, spray underneath with power washer. I usually do this with the wheels off and the wheel well liners out (lots of cruft gets trapped behind there). Sometimes I don't bother with the wheels and wheel well liners and just crawl around on the ground with the sprayer. Apply black penetrating rust-prevention paint to parts of subframe and trailing arms that show rust or lack of paint. POR-15 works well, but Eastwood's Rust Encapsulator is OK too (easier to apply, but doesn't last as long). In a convertible, dust in the interior is a persistent problem. I frequently wipe the seats with a damp microfiber towel. For regular cleaning, I use water or Griot's Interior Cleaner (which is safe on leather), and microfiber towels. Once every few weeks I use Leatherique Pristine Clean on my seats, the leather in the door panels, my steering wheel, and the handbrake handle. Twice a year, I use Leatherique Rejuvenator on my seats and the leather in the door panels. It's wise to do this on a hot day, since it helps keep the pores of the leather open so the capillary action is effective. I try to let the Leatherique sit for a long time, 8 or more hours in warm to hot conditions. It should be tacky when I remove it with Pristine Clean. If I clean the interior, then apply the Rejuvenator, I can let the car sit in the sun for a few hours, then move it to the shade to do my exterior detailing, then clean off the Rejuvenator with Pristine Clean at the end of the day. I always advise going light on leather conditioning. The Leatherique rejuvenator can be applied liberally (and usually should be), but don't do it too often. You should be able to tell when you need to use Rejuvenator, by touch and visual inspection. If you keep your leather clean with routing wiping, you shouldn't need Rejuvenator very often. But your mileage may vary; in hot climates you may need it up to 4 times a year by virtue of sunlight exposure and perspiration. I avoid all cream-type leather conditioners. They tend to clog the pores of our nappa leather, which will speed the deterioration of the leather. Unfinished leather needs to breathe, and creamy conditioners also tend to hold dirt. Your mileage may vary, but I will never use a white cream type of conditioner on unfinshed leather. The main point of clay is to remove large nasty objects from the paint before polishing or waxing. If you don't do this, you're begging to pick up those objects with your polishing pad or wax pad and hence scratch your paint while polishing or waxing. I use a pneumatic random orbital to polish and to apply wax, yet I have zero swirls in my clearcoat. That's partly because I ALWAYS use clay before polishing. Clay is a critical part of any polish and wax job. In addition to removing obvious nasty objects, clay will remove less obvious things that washing may not: brake dust, pollutants, etc. After washing and drying, I wet my hand with detailing spray and run my fingers over the paint in search of non-slick spots. I usually use Griot's Speed Shine or Meguiar's quick detailing spray with clay, but any similar detailing spray will work as a clay lubricant. Spray the detailing spray on the paint, and a little on the clay. Sometimes I only find a few spots that need clay, at other times I find I need to clay the whole car. How can I clean my windshield, windows and mirror glass? I've never really noticed a difference in performance between various windshield cleaners. The key to me has always been the rag. Microfiber towels are excellent for cleaning glass. I also like good quality disposable windshield wipes; I'm still using ones I bought from Griot's years ago (I bought several boxes). For hard water spots that don't want to come off easily with cleaning, I use Griot's glass polishes with a 3" or 6" random orbital and Griot's glass polishing pads. I'm sure there are other quality glass polishes, but I've been using the Griot's polishes for a very long time with great success, so I've had no reason to try anything else. How do I prevent hard water etching of my windshield? This is another area where RejeX or a similar sealant works pretty well. Unlike a carnauba wax, it won't come off quickly when you use your wipers. It probably also prolongs wiper blade life since it's slick. Some of the spray sealants will not stain trim, which can be a boon for use on glass. Avoid products with silicone; it's not paint-shop friendly if you ever need paintwork or even just need to touch up an area. How do I remove hard water etching and spots from my windshield? The same way you would from paint: polish. There are several glass polishes on the market. Use a pad devoted to it if using a random orbital; you don't want glass polish on your paint! I like the pair of Griot's glass polishes (I use them with a Griot's glass polising pad on the random orbital). Clean up with disposable cotton shop towels and then clean with your usual glass cleaner and a microfiber towel. It's not very often that you actually need to specifically remove wax. Clay and polishing will remove it, so it isn't a specific part of my normal routine. Some washes will remove it too, including good old Dawn dishwashing soap (I don't like to do this often; Dawn is very alkaline). When I specifically need to remove some wax in a small area (say for touch-up and langka work), I use 3M Wax, Tar and Adhesive remover, followed by rubbing alcohol mixed 1:2 or so with water. The 3M stuff does the removal, but doesn't dry completely clean. Hence the follow-up with the alcohol/water combination (the alcohol is mixed in mostly because it dries cleanly and quickly but isn't harsh on the paint). What should I use to buff off polish haze and wax haze? I use microfiber towels, and as far as doing it by hand goes, I think it's the best way. I also like microfiber wax removal bonnets for the random orbital. Yes, these days you can get excellent results w/o problems using a machine to remove wax or polish haze, as long as you're reasonably careful. Should I polish by hand or with a random orbital buffer? My personal preference is to use a random orbital, specifically a pneumatic. It's lighter and easier to use than any electric I've used (including the Porter-Cable electric), it generates no heat (no electric motor), and I find it easier to retrieve and store (no cord). At my age, polishing by hand is way too much work. Dynabrade makes very nice pneumatic random orbitals and dual-action machines. You'll likely never need to use the rotary action if you take care of your paint, though it's handy to have the option for other things or for restoring paint that's in very poor condition. A lot of people like the Porter-Cable electric random orbital, but I don't like the fact that it gets warm, it's fairly heavy, and it doesn't have the super-easy palm switch of a Dynabrade pneumatic. Of course, if you don't have an air compressor, an electric is your only option. Can I use a random orbital to apply wax? Yes, of course. However, this depends on your wax of choice. A hard carnauba wax in a can isn't easy to put on with a random orbital, for example. With a squeeze bottle wax, the random orbital lets me get a nice even haze on the whole car fairly quickly (but for the tricky areas that must be done by hand). When I want to use a hard carnauba wax, I usually apply with my bare hands. Body heat will help soften the wax, and you can't beat the feedback of having your fingertips right on the surface. Some hard carnauba waxes can be softened in the microwave, this is worth trying for machine application if you have a favorite hard carnauba wax. Be careful if the container is metal! You don't want a hot liquid wax, just some softening. 20 seconds should be enough time, and can be repeated as necessary. I know there are people out there that think I'm crazy to apply and remove wax with a random orbital. I agree; crazy enough to do two coats in the time it takes to do one by hand. Years ago I switched from carnauba waxes to polymer sealants. They provide significantly greater longevity, and a slick surface that easily sheds pollen and pollutants. Carnauba generally looks better, but doesn't last very long and on a hoot hod like that of the S54 M roadster, tends to allow contaminants to easily embed themselves. As far as products go, there are many choices on the market. I like Menzerna's Power Lock, and today I'm using Wolfgang Deep Gloss Sealant 3.0. In no small part because they offer a compatible spritz that will maintain the sealant between full details. I like RejeX for ease of buffing (haze comes off easier than most carnauba waxes, for example), and for the fact that it easily sheds brake dust (on wheels) and bug splatter (headlights and front bumper cover, side mirrors). It also lasts longer than carnauba. NOTE: this is an excellent wheel protection for our cars, especially if you have stock pads which create a lot of brake dust. NEVER use carnauba wax on our wheels! Brake dust will embed itself in the carnauba (wheels get warm from heavy braking, and brake dust is also warm/hot). What's the deal with waiting so long between coats of sealant? The simple answer here is that most sealants don't like weather exposure while curing, and take 8 to 12 hours to fully cure between coats. How do I remove scratches from my headlights? Polish. The Meguiar's Clear Plastic Polish will handle small stuff, as will Griot's Plastic Polish. So will some of the 3M Perfect-It rubbing compounds. Deeper scratches require the usual sanding and buffing routine, which requires a lot of time and patience and doesn't always produce great results. I've heard that LensRenew works well. Rubbing compound like 3M #39002 has worked well for me in the past. If you want scratch-free headlights and not the work to have them, use a film like Xpel to protect them. It can easily be replaced as needed. The headlight stuff is thick and can help prevent headlight breakage from thrown stones. I've received most of the Systainers I ordered; a single SYS4 T-Loc will arrive tomorrow to complete my latest order. I ordered 24 black 16"x27" microfiber towels from Amazon for wheels, engine compartment and other dirty detailing work. I ordered four more Systainers and another rolling base to complete my envisioned detailing storage. I also created the remaining label cards for the Systainers. I washed the M roadster at the local coin-op car wash, and applied Wolfgang Deep Gloss Spritz Sealant after drying. I continue to like the Wolfgang Deep Gloss Spritz Sealant; it's easy to use, looks good and leaves a slick finish. I used it on my wheels too. Both cars need a full detail, but it's nice being able to squeak by for a bit while the MINI is consuming garage space for repairs. I cleaned the winter dust from the roadster using spray-on car wash, then followed it with Wolfgang Deep Gloss Spritz Sealant. I like the Spritz Sealant. The base sealant on my car right now is almost a year old, and was long past the slippery state. The Spritz Sealant made it slick again, and was very easy to use. Towel-wise, the Griot's Spray-On Car Wash towels continue to impress me for dust removal. They're easily a step above the Chemical Guys Shaggy Fur Ball towels. I'll keep buying them from Advance Auto Parts as long as they continue offering relevant coupon codes. I ordered five 3-packs of Griot's Spray-On Car Wash Cloths from Advance Auto Parts. I used the 'VISA' coupon code to get $30 off. With this purchase I'm fully stocked for day-to-day spray-on wash towels. The Festool Systainer 3 T-Loc for my wheel cleaning towels arrived from Amazon. I will make label cards for it later. The pegboard-mount paper towel holders also arrived from Amazon, and I've temporarily put all four of them in the single-bay garage. Two of them have Bounty paper towels, two of them have Shop Towels. I may buy more for the basement. The red Wypall microfiber towels arrived from Amazon. For the price ($9.99 for 6 towels), they seem to be nice for my intended purpose (cleaning automotive wheels). I ordered four Lehigh pegboard-mount paper towel holders. I ordered a Festool Systainer 3 T-Loc from Amazon to hold wheel cleaning towels. This completes stack 1 of my detailing Systainers. Crude diagram to the right. For stack 2, I will order another mobile base, another Systainer 5 T-Loc and another pair of Systainer 4 T-Loc. Crude diagram to the right. This is the same height as stack 1. For stack 3, I will order another mobile base, a Systainer 4 T-Loc, three Systainer 3 T-Loc and a Systainer 1 T-Loc. Crude diagram to the right. This is the same height as stacks 1 and 2. I ordered four 6-packs of red Wypall microfiber towels from Amazon. These will be my wheel cleaning cloths. The price was too low to pass up ($9.99 for each 6-pack, free shipping via Amazon Prime). I've decided on red for wheels because it's the typical color of a shop rag, and wheels are typically the dirtiest part of my cars. I will probably have some orange towels remaining in the mix for buffing sealant from wheels. Of course I still have disposable towels for wheels. Two Festool Systainer 5 T-Loc storage units arrived from Amazon. So now I have two stacks of T-Loc systainers awaiting the arrival of their mobile bases from Systainer World. I have plans for the next stack, for more detailing tools. One Systainer 4 for polish and sealant, one Systainer 3 for random orbital pads, another Systainer 3 for electric random orbitals and one Systainer 1 for clay. This works out to be the same height as the two Systainer 5 bins I'm using for towels and sprays. With the exception of washing tools/supplies (which I can keep in buckets), a pair of stacks is sufficient for me to detail cars away from home. I should be able to fit all of it plus 2 buckets in the MINI, with room to spare. It breaks down into four 16" tall units. Due to the number of separate bins, the next stack will be priciest... $295 plus the mobile base. In the interest of being able to detail the cars of friends and family, I'd like to have a pair of electric random orbitals: a 6" and a quot;. I will likely buy the Griot's versions, since I don't want to spend a lot of money for tools I won't use frequently. The Flex tools are very nice, but it's hard for me to justify the price for a tool I'll use only occasionally. Storage is an open question; I assume I can fit them both in a Systainer III, but I won't really know until I have them. The two Festool Systainer IV T-Loc storage units arrived from Amazon, a day earlier than expected. I also received the six buckets with gamma seal lids from BayTec Containers. I mixed the colors on the buckets that I put GritGuards inside: the blue bucket with a yellow gamma seal rim and the yellow bucket with a blue gamma seal rim have GritGuards in them. The other two yellow buckets have full yellow gamma seal lids and the other two blue buckets have full blue gamma seal lids. It's worth noting that Autogeek wants $35 plus shipping for a single bucket with gamma seal lid and GritGuard. I paid less than $15 per bucket with gamma seal lid, and already had the GritGuards which were $9 each. I saved more than $11 per bucket (plus shipping costs) versus buying directly from Autogeek. The gamma seal lids are exactly the same, made by the same company here in the U.S.A. I removed the tags from several sets of the microfiber towels I received recently, and put them in one of the Systainer IV T-Loc containers to test fitment. It appears to me that I don't really need a Systainer V T-Loc for day-to-day towels, but we'll see when my second one arrives. I ordered three yellow buckets, three yellow gamma seal lids, three blue buckets and three blue gamma seal lids from BayTec Containers. I received six 24x16" Fluffer Miracle Supra Microfiber Towels, three 24x17" Big Monster Microfiber Extreme Thickness Microfiber Towels, some interior dusting brushes, a gallon of CG Speed Wipe, a Light Clay Bar, a Clay Block Kit, a pad cleaning brush, a 12-pack of Microfiber Super Towels for sealant buffing, four Sasquatch Maximus microfiber towels for interior dusting, six Shaggy Fur-Ball blue microfiber towels for day-to-day detailing and spritzing and a 3-pack of Professional Spray Bottles from Chemical Guys. I cleaned the majority of the nasties off of the outside of the winter wheels on the MINI. It looks like we're going to get sub-freezing temperatures this week, so I'm leaving them on for another week. I used the new Mother's wheel brush and the new Daytona Speed brush. These both make it a lot easier to clean wheels. The Daytona Speed brush allows you to get the inside of the barrels too, though I didn't really work on that today. I need some CarPro Iron X and Tar X to really get wheels clean without removing them from the car. I really need another cart. At a minimum, to hold harsher cleaners like LA's Totally Awesome, engine degreaser, Simple Green, Iron X, Tar X... the stuff for wheels, undercarriage and degreasing. Having a separate cart for this would let me perform these parts of detailing more easily, and I can then put that cart away before moving on to washing the body. I ordered more supplies from Chemical Guys. Six more 24x16" Fluffer Miracle Supra Microfiber Towels, three more 24x17" Big Monster Microfiber Extreme Thickness Microfiber Towels, some interior dusting brushes, a gallon of CG Speed Wipe, a Light Clay Bar, a Clay Block Kit, a pad cleaning brush, a 12-pack of Microfiber Super Towels for sealant buffing, four Sasquatch Maximus microfiber towels for interior dusting, six Shaggy Fur-Ball blue microfiber towels for day-to-day detailing and spritzing and a 3-pack of Professional Spray Bottles. The Griot's sprayers were formerly my favorite, but the new design is crap compared to the old so I've switched to Chemical Guys. I ordered a Griot's lug nut cleaning brush, Griot's Heavy Duty Wheel Cleaner and Griot's wheel Cleaning clay from Amazon. I just realized I forgot to order some stronger wheel cleaner. I could use some of the Sonax Wheel Cleaner Full Effect, and I would like to have some CarPro Iron X rust remover and Car Pro Tar X tar remover too. 303 Fabric Guard, Leatherique Prestine Clean, a Gummi Pflege stick, Detailer's Pro Series Wheel Cleaner, Detailer's Pro Series Wheel Glaze, some Wolfgang Finger Pockets, a Daytona Speed Master Wheel Brush and a 64 oz. refill of Wolfgang Deep Gloss Spritz Sealant arrived from autogeek.net. The Luxor STC211 cart arrived from Wayfair. For $100.99 with free shipping, it's a good cart for detailing. It's all plastic except the casters, so it should be essentially impervious to water and obviously will not rust. The top is not truly flat; there's a slight ridge around the edge, maybe 1/8" tall. I consider this a good thing for a detailing cart. I wanted a near-flat top to make it easier to lay some items on the top and not have a top that could hold much water. The ridge has little effect on either of those function. It went together in about 5 minutes, the only tool needed is a rubber mallet. I previously said I could probably use another one, and I've every reason to believe it's worth buying a second one. I've put it on my wish list. This one will quickly be loaded with the intended day-to-day detailing products: spray-on car wash, detailing sprays, spritz sealant, microfiber towels, etc. I also received the Paint Prep, 6" glass polish pads, microfiber and pad cleaner, spray-on car wash, spray-on car wash cloths and Finest Sprayers from Griot's. Since I forget to mention it here... I also received a Festool T-Loc Systainer V container last week. I was going to use it for storage of some detailing products, but I haven't made my mind up yet. It's a fantastic container like all of the Systainers, but perhaps overkill for detailing consumables. It's not like I don't have many other things to store. What am I still missing for a full detail? 303 Fabric Guard, Leatherique Prestine Clean, Gummi Pflege, Detailer's Pro Series Wheel Cleaner, Detailer's Pro Series Wheel Glaze, some Wolfgang Finger Pockets and a Daytona Speed Master Wheel Brush. I ordered these from autogeek.net, along with a 64 oz. refill of Wolfgang Deep Gloss Spritz Sealant. I also need to replenish some supplies from Eastwood... namely the 13665 ZP undercoating kit, Extreme Chassis Black Primer and some Extreme Chassis Black Satin paint. I ordered a Luxor STC211 cart from Wayfair. I could probably use another one, but I want to see the first one in person before buying another. I ordered Paint Prep, 6" glass polish pads, microfiber and pad cleaner, spray-on car wash, spray-on car wash cloths and some Finest Sprayers from Griot's. The Mothers tire, wheel and well brush kit, the RaggTopp natural horse hair convertible top brush, the Grit Guard dual bucket washing system, a bucket seat cushion, Menzerna PO85RD polish, two Lake Country 6.5" flat gray foam pads, two 6.25" Optimum microfiber polishing pads, and two 3.25" Optimum microfiber polishing pads arrived from AutoGeek. Microfiber towels arrived from Chemical Guys: one 26x35" waffle wave drying towel with pockets, six 24x16" Fluffer Miracle Supra Microfiber Towels and three 24x17" Big Monster Microfiber Extreme Thickness Microfiber Towels. The Menzerna Intensive Polish (PO91E), Menzerna Final Polish (PO85U), Wolfgang Deep Gloss Paint Sealant 3.0, Wolfgang Deep Gloss Spritz Sealant and Grit Guard bucket grit guards arrived from autogeek.net. I ordered more stuff from autogeek.net. The Mothers tire, wheel and well brush kit, the RaggTopp natural horse hair convertible top brush, the Grit Guard dual bucket washing system, a bucket seat cushion, Menzerna PO85RD polish, two Lake Country 6.5" flat gray foam pads, two 6.25" Optimum microfiber polishing pads, and two 3.25" Optimum microfiber polishing pads. I used a coupon code that saved me $20. I ordered some microfiber towels from Chemical Guys. I needed some new quality ones for polish and wax removal, as well as quick detailing. My order arrived from Griot's. I put most of it away in the detailing cart. It's worth noting that the regulator fitting bottoms out in the random orbital long before the NPT thread gets tight enough to seal with 2 to 3 layers of teflon tape on the threads, so the tool leaks air at that junction. I'm just going to live with it for now, but may later drop an O-ring or silicone washer in there to seal it. For the price, I like the tool and it'll be handy for my bumper covers, mirrors and other areas. I ordered a simple 3" pneumatic random orbital from Griot's. I'm assuming it's actually a Chicago Pneumatic, but that's fine. I still have a Dynabrade 3" or 3M 3" on my wish list, but the one from Griot's is small and due to being shaped like a 90-degree die grinder, will reach places that a palm orbital will not. It was also inexpensive. I ordered several 3" pads: glass polishing pads, paint polishing pads and waxing pads. I also ordered a 3" pad holder for the places where I need to use the pads by hand. I ordered some new microfiber drying towels (the Griot's ones are much better than any other I've used, and I've used MANY). Finally, I ordered some supply restock: both glass polishes, dried-on wax remover, pre-wax cleanser and vinyl/rubber dressing. One thing I forgot to order from Griot's... the magnetic paper towel holder. However, I suspect I can find it for less elsewhere. I ordered some Wolfgang Deep Gloss Paint Sealant 3.0, Wolfgang Deep Gloss Spritz Sealant, Menzerna Intensive Polish (PO91E), Menzerna Final Polish (PO85U), and a pair of Grit Guard bucket grit guards from autogeek.net. Normally I would buy Menzerna Power Lock as my sealant, since I've been happy with their sealants for a very long time. However, I wanted to try something new, and the Wolfgang gets good reviews. I also like the fact that their Deep Gloss Spritz Sealant is a complementary product for use between full detail jobs. I picked up some Sterilite stacker containers at Walmart today, which fit onto the lower shelf of my new detailing cart. Two 4-gallon ones will be used to store microfiber drying and general cleaning towels, and two 7-gallon ones will hold polishes, waxes, detailing spray, glass cleaner and other fluids. I probably need to buy more paint cleaning clay. I can pick that up locally. I'd also like to order some glass cleaning clay and wheel cleaning clay from Griot's. I washed the car, clayed it, polished it and waxed it. I also cleaned the engine compartment with citrus-based degreaser and Meguiar's detailing spray. I vacuumed and cleaned the interior. I washed, clayed, polished and waxed the car. I ordered a case of Tork 520378 towels from storeseven.com. I was on my last pack. I also ordered a dispenser for them for Randy (I already have one). I used the Menzerna Power Gloss Compound on the hood, which got rid of my hard water spots. I finished it up with Intensive Polish, Final Polish II, glaze and FMJ. I also put a coat of FMJ on the rest of the car so I can drive it. I ordered Menzerna Power Gloss Compound from autogeek.net to remove the hard water spots from my hood, as well as to deal with some scratches. I clayed, polished and glazed the passenger side fenders and door. I'm still waiting for clearcoat touch-up so I can do the hood. I clayed, polished, glazed and waxed the trunk lid. I also wetsanded the deepest scratch before polishing. There are several other scratches, but I don't have time to deal with them at the moment. I put the car up on jackstands to wash the underside. It was actually quite clean already. I don't think I've had it off the ground for a cleaning since late summer of 2005. I guess what I'm doing at the spray wash is working. I put Leatherique Rejuvenator on the driver's seat to sit in the sun while I cleaned the exterior. I thoroughly cleaned the ragtop and applied 303 Fabric Guard. I found a new door ding from this week, driver's side. Something for the tent at Homecoming (an excuse to tip a tech generously). I used Menzerna glaze and their FMJ wax to finish things up. The X-pel for the front bumper cover should arrive today. My front bumper cover is being repainted on the 16th. I ordered an Xpel kit for it, as well as an Xpel kit for the rear fenders and the headlights. However, I might not use the one for the rear fenders; I have some uncut 20 mil film I could use there. I'm planning to have my hood repainted sometime after Homecoming. After that's done, I'll Xpel the hood. I finished the Pristine Clean. I then washed and dried the exterior, and clayed off my cone marks from Saturday's autocross. I then waxed the car again with menzerna FMJ. Today I tried the Black Again product on my wheel well liners, and my head cover. It works well in the wheel wells, but I don't like the shininess on my head cover; I'll probably clean it off. And like other products of this type, it leaves oiliness. Maybe someday I'll find a product that leaves everything clean. I'll probably go back to using kerosene on the wheel well liners, which cleans them well but doesn't leave an oily film. I started cleaning the interior today. It was quite dirty due to not being thoroughly cleaned since the fall, and the TrackTime school at MIS yesterday (instructor and I in and out of the car many times, and it rained a couple of times). I even broke out the carpet cleaning machine for the driver's side footwell. I also applied Leatherique Rejuvenator. I got part way through cleaning it off with the Pristine Clean, I'll finish tomorrow. I washed and waxed again today. This time I used menzerna FMJ over menzerna glaze. To be honest, I didn't notice any real difference from the Meguiar's NXT. However, I do really like the menzerna polishes, they work well. I also like the new pads for the pneumatic random orbital that I bought from properautocare.com. I also used the Griot's Fine Glass Polish today. It works nicely at removing water spots that normally take a lot of elbow grease with glass cleaner and a microfiber towel. I found a new scar on my hood. It's on the passenger side, and is vertical. It wasn't there last week. Argh, I'm guessing someone did it in the parking garage even though I usually park on the roof away from other cars. I'll need to do some touch-up and Langka this week, then re-wax that spot. I washed and waxed the car today, this time using Meguiar's NXT wax and Wheel Wax. Only the hood was polished; I'll do the rest on the next round. I did put the car on jackstands and washed the underside. I can get the following from everythingabrasive.com. The Dynabrade 58436 toggles between a rotary sander and a 3/16" orbit random orbital.